Another title I considered for this post was _Tree Geometry and Snow_ after the chapter title "Tree Geometry and Apical Dominance" in The Trees in My Forest by Bernd Heinrich. I planned to reread this book this year. With the recent snowfall, I read all the chapters about the why and how of tree growth. The most instructive for this post was the chapter titled "Construction for Strength". Last Sunday, the morning after the city received five inches of snow (four more than predicted), my family and I walked to Washington Square Park to get some fresh air and to watch the chipping of our neighbors' discarded Christmas trees. In between snow play and tree mulching, I photographed snow on several of the coniferous evergreens and deciduous broadleaf trees and shrubs in the park. Here is basic tree geometry: conifers, which tend to be evergreen or partially so, typically grow symmetrically and straight vertically. Deciduous trees, mostly broadleaved, tend to have more rounded shapes. Within these generalizations are variations depending on species and environment. For example, ash, maple, and poplar trees are more "upward-pointing" while birch trees are "bushier". White pine is shade intolerant and so grows quickly vertically to maximize access to sunlight but in an environment where it grows as a specimen tree or without competition, it tends to grow horizontally, branching out and not adhering to an apical dominance regime with a single leader branch. Upward-pointing versus bushy growth is differently impacted by snow loads (or ice). A more vertical tree (trunk, branches, twigs) presents less surface area to snow and rain (or ice). Where the branch attaches the trunk, the shape is more like a V which means snow or rain flows towards the trunk-branch attachment which can support more weight than the tip of a branch or twig. Imagine a deciduous tree in leaf or recently leafed out caught in a snow or ice storm! Such a bushy aspect under snow or ice loading would likely lead to significant loss of limbs. Evergreen conifers retain their leaves in winter and withstand snow loads. Their vertical and symmetrical geometry is that of a cone hence the name conifer. These trees are wider on the bottom and narrower on the top. 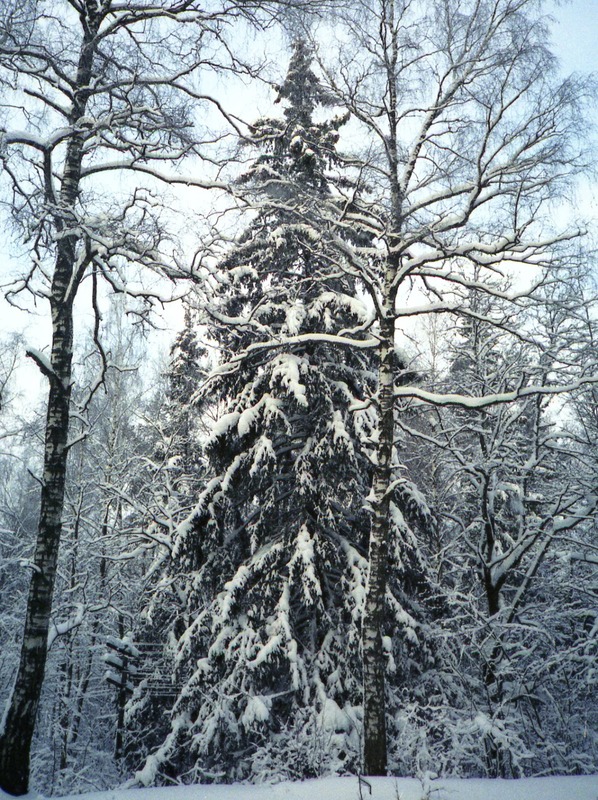 The weight of snow causes the higher branches to droop unto the wider lower branches which can support the load. Think of how an umbrella sheds rain or how snow slides of a pitched roof. Remember earlier I mentioned partially evergreen conifers? It turns about that white pine falls in this category. It "sheds half of its leaves each fall", the older ones closest to the trunk. Balsam firs and red spruces shed their leaves for between five and 10 years. Some conifers are deciduous such as the Dawn redwoods planted in Washington Square Park. There are broadleaf evergreens, too, like the hollies growing near the half-circle seating areas on the eastern side of Washington Square Park. You also may encounter some red oaks that cling to their leaves or red oak leaves that cling to their trees. The more you learn about trees, the more fascinating they are in all seasons. Stay tuned for a self-guided winter walk through Washington Square Park. I love the way trees look in the snow, especially locust trees and birch. Hi Science Notebook. I'll look out for snow on locusts and birches. Thank you for reading!